Whether debating Marxists, college professors, or Islamic apologists, Josh McDowell’s hallmark has always been to walk boldly into enemy territory and speak truth. 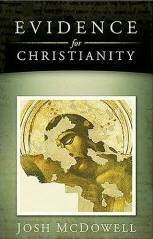 This book is based on the expectation that, with a growing number of adults becoming increasingly skeptical toward Christianity, there is a need for a solid body of persuasive evidence to be presented to them. This is a sourcebook for doubting seekers as well as current believers who need persuasive information to share with friends. Evidence for Christianity is McDowell’s compelling answer to the hard questions so many Christians are afraid to discuss.